Alvaro Morata kept up his current good run of form for Chelsea this afternoon, as the Spaniard opened the scoring for the Blues against Crystal Palace at Stamford Bridge. Morata, who’s struggled dearly since moving to the west London club, scored his third goal in his last four games in the Premier League with his strike against the Eagles. 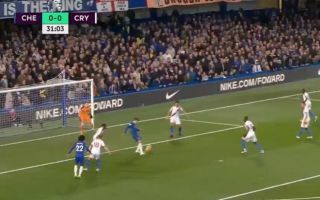 The goal itself was impressive, as a cross from Pedro found Morata, who controlled the ball, turned and fired home past Wayne Hennessey in the Palace goal to open the scoring. Here’s a clip of Morata’s strike this afternoon. Seems like he might finally be finding his feat at Chelsea after this recent upturn in form! The hosts begin to take control of the game as Alvaro Morata sticks away Pedro's cross.